‘The music produced by the Neon Quartet is at once muscular and thoughtful, rich and subtle, its four members bouncing ideas off each other with infectious enjoyment’. Neon Quartet is made up of four extraordinary musicians equipped with strong personalities and individual sounds, but it’s when the four play together that the magic really happens. Led by legendary British saxophonist Stan Sulzmann, the quartet combines the values of experience with the freshness and vitality of youth. Featuring three of the most talked about and in demand players of their generation: Kit Downes, Jim Hart and Tim Giles, Neon’s latest album “Subjekt” looks set to firmly root this formidable band as one of the most exciting and leading chamber jazz ensembles in the UK scene. 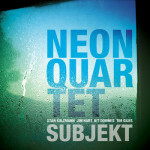 Subjekt is the new album by the Neon Quartet and their second for Edition Records. Their music is rich in colour, rhythmically robust and melodically persuasive, bursting with texture, nuances and interplay. Subjekt is available to purchase at Edition Records. Catch Me is available to purchase at Edition Records.